The closest thing I've encountered so far to a durian harvest festival is the annual fruit fairs in the eastern Thailand provinces of Chanthaburi, Rayong, and Trat. In 1999 (and again in 2005) Chanthaburi was calling their fair the "World Durian Festival." Though much of the rest of the durian world probably didn't hear about it, Chanthaburi has earned the right to claim that name for their festival, as it is the durian capital of the world in terms of production (over 48,000 hectares [120,000 acres] of durian orchards, producing about half of Thailand's entire durian crop [which in 1999 was reportedly over 900,000 tons, or 820 million kg]). In 2000-2004, I didn't see the name "World Durian Festival" at the Chanthaburi festival, rather "Fruits Fair," probably in deference to the other fine tropical fruits grown in Chanthaburi also in large quantities (mangosteen, rambutan, longkong, jackfruit, and others). Chanthaburi's fruit fair includes events common to country fairs around the world, including competition and judging of the best quality durians, rambutans, jackfruit, mangosteens, and longkong, entered by fruit farmers; carnival rides; a large flea market; educational exhibits; a gem show and temporary shops; and of course large quantities of local fruits for sale in the marketplace, including at least 5 varieties of durian (Monthong, Chanee, Poungmanee, Kan Yao, and Gradoom). The most spectacular element, though, in my opinion (other than the fine durians and other local fruit, of course), and worth traveling to Thailand for in itself, is the fantastic street parade on the opening morning of the 10-day festival. 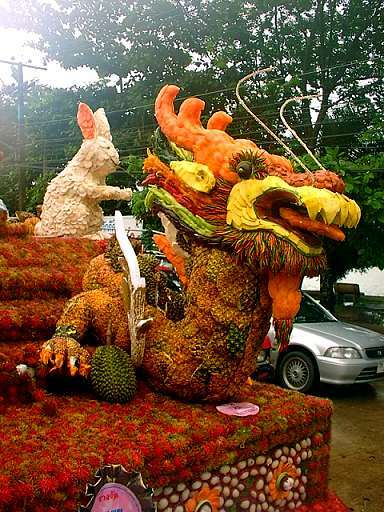 Traditionally in Chanthaburi, the parade consists of monumental large floats mounted on trucks, which are completely masterfully, artistically, and astonishingly decorated with thousands of tropical fruits (and some vegetables too)! In 2000, I made the first web photo gallery of these fantastic temporary wonders of the world, during the rainy Chanthaburi Fruits Fair in June 2000; photogalleries from more recent years can also be found here on Durian Palace through the homepage links. Below are a few sample photos. Astonishing, incredible, and beautiful folk artistry! In spring 1999, 2001, 2002, and 2003 I also visited the fruit festival in Chanthaburi's neighboring province Rayong, at the Tapong Fruit Market grounds. This fair is more strictly a fruit fair, with several hundred different sellers of durians and other exotic fruits, and thousands of local people gathered for the festivities on the Saturday opening day. 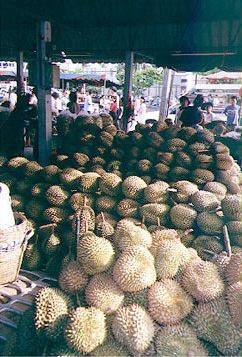 Everywhere, small mountains of durians. Of course, with their spiky rinds, durians stack very well! In 1999, I fortunately arrived on the afternoon of the first day (a Saturday), and encountered a few very memorable events. Apparently that morning they had had their fruit competition and judging of durian fruits from many different growers; the prize-winners with their various ribbons were prominently on display. As I arrived, a very energetic durian auction was underway, auctioning off a small mountain of growers' best durians that had been in the competition and judging, all with attached tags and many with triangular windows cut into the rind for display. The auctioneer was wild, and there was much mirth and laughter, as the crowd of durian-lovers bid for and bought these top specimens of durian-dom, all in Thai language of course... very sanuk (fun) and a real spectacle. The other wild event at the Rayong fair was the durian-eating contest... there were 10 contestants at a long table, and they each had a very large plate of durian sections placed in front of them. When the starting bell rang, they all chowed down — a hilarious happening, particularly the winner, a young man who managed to consume an amazing quantity of durian in a very short time, twice as fast as any of the others who all retained their proper Thai etiquette — he instead stood up, used both hands and left table manners and the other contestants far behind! In 2001 and 2002 at the Rayong fair I jumped in and entered the durian-eating contest myself — to the great merry glee of all the local Thai people, as most Thais are used to Westerners despising durian rather than enthusiastically liking it! I must say, that is a lot of durian to eat quickly, and I really do prefer to savor it rather than stuff it down fast with a big crowd of people looking on! But it was a really fun and hilarious experience...despite my great liking for durian, I was no match for the lifelong local Thai durian-eaters, and I came in last in 2001 and close to last in 2002...we were on Thailand nationwide TV news that night, as there were several big TV video cameras on us the whole time! On the island of Penang, in Malaysia, where some of Malaysia's finest gourmet durians are grown, some luxury hotels offer "Durian Eat and Stay" packages. Not exactly a durian festival like the ones in Thailand, but it's sort of a personal durian festival! I'm sure there must be other durian festivals and tropical fruit festivals in Southeast Asia during the harvest seasons; if you know of some, please e-mail me and I'll mention them here. If you like durian and other tropical fruits, going to these fairs is a very memorable sort of pilgrimage!